Star Trek: First Contact doesn’t feel like the typical Star Trek movie. For starters, it is considerably darker than any Star Trek movie which has gone before, beginning with some minor body-horror just to set it’s stall out early. Horror definitely has a part to play in the movie, being the scariest of the sci-fi movie franchise but never throwing itself into the full-on scares. This is due to the excellent villain used for the movie. The Next Generation introduced a great Star Trek bad-guy in the Borg, a cyborg species of alien which collects species and “assimilates” them, in nasty, effect-laden scenes used to showcase their potential threat. They are faceless, everywhere and almost unstoppable. It also helps that there is a link directly to the TV series, giving the main plot of the movie a personal touch, especially for Patrick Stewart’s Captain Jean-Luc Picard who is never better. Not that the Borg is the only plot here. First Contact juggles three plots, the second of which is the titular story. The rest of the Star Trek crew is tasked with ensuring humans “first contact” with aliens takes place, making for the more lighthearted and genuinely funny parts of the movie. This is down to Star Trek newbie James Cromwell realising he is famous and coming to grips with what future events will happen. It is a nice sub-plot which has some great humour but moments of poignant drama as well. The only plot point which falters is one involving Brent Spiner as Data. His story involves some bizarre robot on robot “love” between the regular cast member and “leader” of the Borg, played by Alice Krige. It doesn’t fit with the rest of the movie and will make more than a few audience members cringe at how badly it is handled. Some plots are a misstep. The rest of the movie makes up for it though and it is one that includes some great action and tense moments. Scenes go from out-and-out fun, to edge of your seat thrills, including one great moment set on the actual hull of The Enterprise, while in space! It manages to capture the Sci-Fi spectacle of Star Trek while offering something new to the series. Of all the different plots and characters involved, Stewart’s Picard is the central focus and handles the action ably. He is never the most convincing of action heroes but does deliver when it comes to a very good finale, one which rounds off the movie very well. 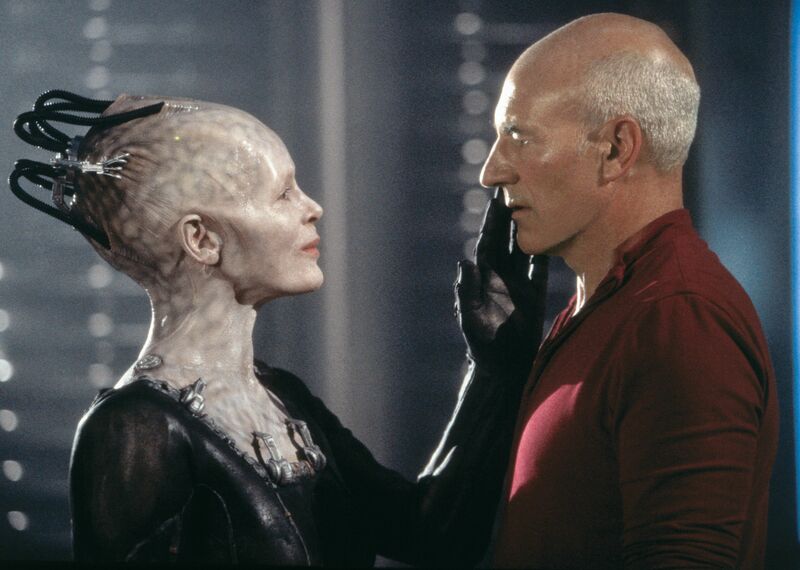 Overall, Star Trek: First Contact is an exciting, tense and at times scary offering in the series but one which delivers in both character and story. It uses a great villain, a clever story and some genuine drama for the characters to add depth to the action. One minor sub-plot misstep aside, a great Star Trek film. I enjoyed this movie a lot, and I’m not a big Star Trek fan!